From prehistoric man to ancient Greece, from Celtic times to Russia of the 1800s, beards have been worn by bad asses. Just look back at what we know of the dawn of man. Neanderthal men had beards, and wore them for many reasons. They acted as a layer of protection from the harsh outside world and wilderness. If we weren’t supposed to have beards on our face, then it wouldn’t be in our genetic code as men to have the ability to grow a beard. Ben Affleck was a C-List actor who was going nowhere when he had no beard. Suddenly, he grows a beard and wins an oscar and is back at the top of the pile. Luciano Pavarotti went from a small time singer playing local venues. Grows a beard, Becomes international superstar. When Steve Jobs set up Apple and it nearly failed, he was beardless. He comes back armed with a beard and now they are one of the world’s most successful company. Coincidence? I think not.The Beard seems to give you a strange power that will improve your life. If you possess the genes for good facial hair growth, you must also possess the understanding of the care and maintenance required to make sure your beard doesn’t go awry. You might be fine with an unkempt beard that crumbs and forest animals take root in, but your spouse and/or employer may likely feel otherwise. Once one of the most sought after men’s grooming products, mens beard oil’s were seemingly banished to the history books by most of the male grooming industry. But now it’s coming back in a big way. For many, grooming is not just a daily regime, it’s an adaptive mode of personal expression. For these guys, grooming is practically a contact sport. And we at Whiskers could not be happier about this. Groom your whiskers with Whiskers power Beard Oil, an exotic non sticky beard grooming product from Whiskers. 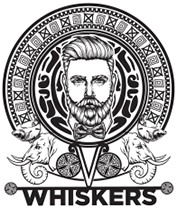 Whiskers Beard Growth Oil has been specifically crafted to promote the growth of beard and facial hair offering a perfect blend of natural ingredients for a shiny, soft appearance of your beard. A heady concoction of natural ingredients, Apricot oil, Wheat germ oil, Jojoba oil, Argan oil, Grapeseed oil clubbed with nourishment of vitamins and minerals, Whiskers Power Beard Oil makes your beard cottony soft, frizzy free, manageable, shiny and intense. On the top of every beard grows a man and that man knows how to take care of his beard. Give your beard the magic touch of Whiskers Power Beard Oil because beards are not grown, they are earned. Grow your whiskers with Whiskers.